Official news on Charlie new action-horror series, The Enemy. Something very cool about to go up on my site. Stand by. Hopefully after this series he either returns to Bond or writes some adult novels. I personally don't have much use for a horror series for children. I think it will be a blast. Like Grimms fairy tales, the best horror is always written for children. And I think anything Charlie does is worth checking out. "Only children under fourteen remain, and they’re fighting to survive." UPDATE. Puffin has launched an official website. Might be worth trying simply for the fact that Higson has proven he definitely knows how to write perfectly paced action/adventure with the Young Bond series. Can't wait for this. Despite the focus on kids, it all sounds very dark and macabre. 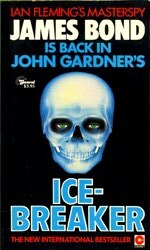 And the Young Bond series has shown us that Higson handles gore well. I'm looking forward to Charlie taking us on a new, original ride. As in not good, or as in scary (as it's supposed to be)? I like it. I had no expectations or requirements. It's not like it's a Bond book, so I got no dog in this fight. I think it does the job. Clearly it's a scary book by Charlie Higson (nice big above the title billing). 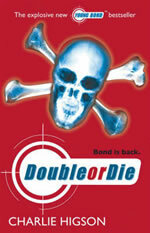 The skulls are very similar to the Double or Die cover, so maybe this is an excuse to redo new editions of Double or Die. Always thought that could have been a stronger cover. Let's get a gambling or puzzle image on DOD. Can't have kids confused, Puffin. I like it. Good, bold, scary, adult cover. And Higson's finally getting some worthy billing on his books. This is interesting. Had no idea Charlie was such a horror buff. I just pre-ordered my copy from The Book Depository. At £9.74 (25 percent off the full price), plus free worldwide shipping, it's too good a bargain to pass up. My girlfriend and I recently ordered a couple of books from The Book Depository and they were delivered less than a week after they shipped (mine took a few days to dispatch, mind). Excellent service. Charlie actually has written four adult thrillers, which are being reprinted this year (two are out and two will be published in August). They're all available from Amazon.co.uk - I'm tempted to pick them up as well. Anybody else experiencing déjà vu? Pretty cool trailer for the book (featuring Charlie) on the official site. My order is currently processing - should have it in my hot little hands next week! I'm actually not sure when I'm going to get/read this. Not being YB, I didn't feel I could ask Puffin for an advance copy. I did have it pre-ordered, but I think I'm going to wait and see what kind of collectible copies pop up on eBay (signed or with extras). I'm also moving and packing up the house, so my world is in chaos. I look forward to getting and reading the book in my new digs...so that means it won't happen until after the 15th. Have you read Charlie's adult thrillers, zencat? I keep meaning to buy them but I already have way too many books to read here. No, I haven't, but I want to. Planning on getting a set of those new reprints. All your hard work on YB plus you always plug Charlie's other works, with all that surly they would send you and advance? Is it in soft back or hardback? After YB it's sure to be a hit. Lets face it he can write a dam good book. I really tapped into the YB series. Even it's for kids it evokes memories of when I was one. THE ENEMY IS LOOSE IN THE UK. You can view a gallery of pics from yesterday's launch event at the London Tombs through the link. Also a bit of exclusive news: U.S. release is May 18, 2010. Had a look at The Enemy in a shop today, yes, I was aloud out! Puffin do a bloody good job on Higson's books. Lovely black end papers. And the ones I saw were already into second printing. See below for a chance to win a signed copy of The Enemy! Which popular children's book series is written by Charlie Higson? Got my copy in the post today - as with his Young Bond books, Puffin have gone above here: it's a gorgeous hardcover with the artwork pressed directly onto the boards and black edges to the pages. For the Young Bond collectors, there's a full-page ad at the back of the book for Higson's five Young Bond books and the graphic novel adaptation of SilverFin.